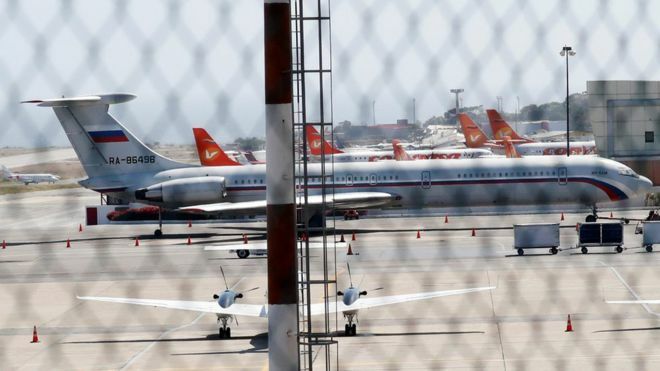 According to official reports (released on March 24, 2019), two Russian Air Force planes arrived in Caracas on March 23. Russian military jets — an Ilyushin IL-62M passenger jet (RA-86496) and an Antonov AN-124 military cargo planes flew from Chkalovsky airbase to Simón Bolívar International Airport, Caracas (also known as Maiquetia Airport) via Syria — carrying Russian defense officials and nearly 100 troops. Reporter Javier Mayorca wrote on Twitter on Saturday that the first plane carried Colonel General Vasily Tonkoshkurov, head of the Mobilization Directorate of Russia’s armed forces, adding that the second was a cargo plane carrying 35 tonnes of material. The planes being protected by a contingent of Venezuelan National Guards (Guardia Nacional Bolivariana de Venezuela - GNB). In December, Russia's Defense Ministry sent two nuclear-capable strategic bombers to Venezuela in an unusual display of Russian military force in South America -- a move that angered the United States and many other regional countries. The Russian ministry at the time said the two Tu-160 bombers had arrived at an airport outside of Caracas on December 10. The statement did not say if they were carrying weapons. This was the third time in post-Soviet times, strategic bombers land in Venezuela. Similar trans-Atlantic flights took place in 2003 and 2008. The bombers' arrival came just days after President Nicolas Maduro visited Moscow, seeking Kremlin support for his country, whose economy is in shambles and which is deeply in debt to Russia. Moscow supports Maduro in his tense battle for control of the Venezuelan government with opposition figure and self-declared interim President Juan Guaidó, who is backed by Washington and many European countries. Maduro has accused Guaidó of trying to mount a coup against him with the help of "US imperialists". Moscow echoed that line, accusing Guaidó of an "illegal attempt to seize power" backed by the United States and pledging to do "everything required" to support Maduro.